No. 11 & 13, Jalan Anggerik Mokara F31/F, Kota Kemuning, 40460 Shah Alam, Selangor, Malaysia. 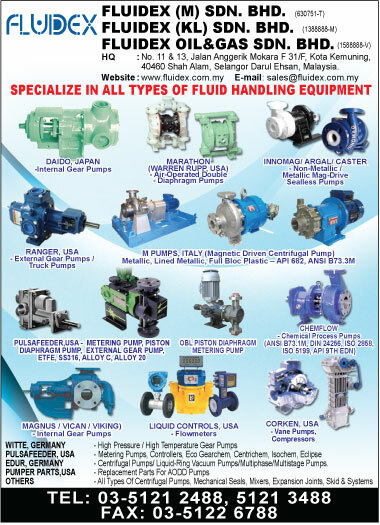 FLUIDEX being established in year 2003, with combined experience over 50 years, has specialized in the supply, repair of industrial pumps. Determination to provide a First Class service to you the customer has ensured its continuing success. A reputation based on quality, service and price means that satisfied customers return time and again with complete confidence. FLUIDEX is a unique organization which combines a high level of technical expertise with the time honored belief that “our word is our bond”. The quality of this service is well known throughout the company’s major markets and is reflected in its highly respected customer list. This includes local government agencies, blue chip companies in chemical, petrochemical and pharmaceutical industries along with paint, glue, textile, marine industries, oil & gas industries, biodiesel industries, oleochemical industries, diesel, fuel oil & etc. Outlined on the following are the lines of products that FLUIDEX can offer your company through the skill and expertise.